The new codeshare between airberlin and Alitalia, accompanied by a reciprocal frequent flyer agreement, reveals the guiding hand of Etihad Airways. It is another example of the growing cooperation among Etihad's equity investment airlines, whether current (airberlin) or prospective (Alitalia). This follows the launch of Etihad Airways Partners, which includes airberlin, but not yet Alitalia, although the latter it seems very likely to join after European Commission approval of Etihad's purchase of a 49% stake in it. Both the new codeshare and Etihad Partners reflect a more liberal mood within the global alliances, allowing cooperation across alliances. Airberlin and Alitalia will remain members of oneworld and Skyteam respectively. The airberlin/Alitalia codeshare also comes just after an unexpected decision by Germany's federal aviation authority Luftfahrt Bundesamt (LBA) to reject airberlin/Etihad codeshares on 34 routes this winter. These are around half of the routes operated under airberlin's codeshare with Etihad and have received approval in the past. The LBA appears to have reversed its decision, at least temporarily. If it stands for the longer term, the past week looks like a case of one step forward, two steps back for airberlin. Airberlin and Alitalia have signed a codeshare agreement covering all of airberlin’s and Alitalia’s 412 weekly nonstop flights between Germany, Austria, Switzerland and Italy, effective this winter. Furthermore, airberlin’s services to Milan from Dusseldorf and Berlin Tegel will operate into Linate instead of Malpensa and airberlin's LCC subsidiary NIKI will switch its Milan service from Vienna to Linate. In addition, the codeshare agreement will apply to certain routes beyond their home hubs. These will include airberlin carrying Alitalia's “AZ” code on domestic flights from Munich to Cologne, Dusseldorf, Hamburg and Berlin. Airberlin's “AB” code will be carried on selected domestic and international Alitalia flights, including those from Rome and Milan Linate to Naples, Brindisi, Reggio Calabria, Alghero, Athens, Malta, Sao Paolo and Rio de Janeiro. Codeshares on Alitalia’s long-haul and some international medium haul routes will require regulatory approval. Airberlin and Alitalia have also signed a reciprocal frequent flyer agreement allowing their passengers to earn and redeem bonus miles on the entire route network of both airlines from 1-Nov-2014. In a further sign that their partnership will not stop there, they expect further synergies to arise from "optimised aircraft rotation and avoidance of expensive overnight aircraft stops." The agreement is of greater significance to airberlin than it is to Alitalia. Italy is its second most important international destination country after Spain (albeit a fairly distant second). 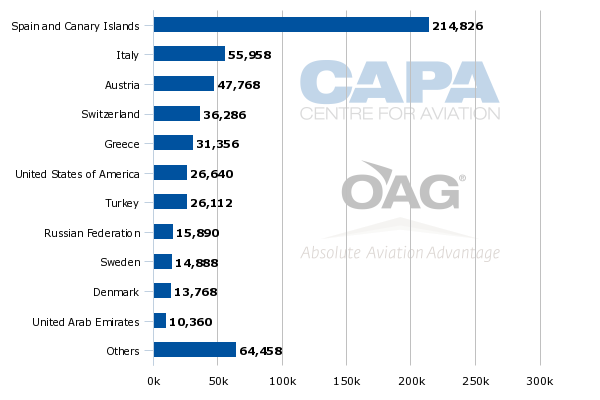 Based on data from OAG for the week of 13-Oct-2014, Italy represents 10% of airberlin's international seat capacity and 7% of its total capacity. Airberlin operates 30 routes between Germany and Italy and seven routes between Switzerland and Italy. Its subsidiary NIKI operates three routes between Austria and Italy. 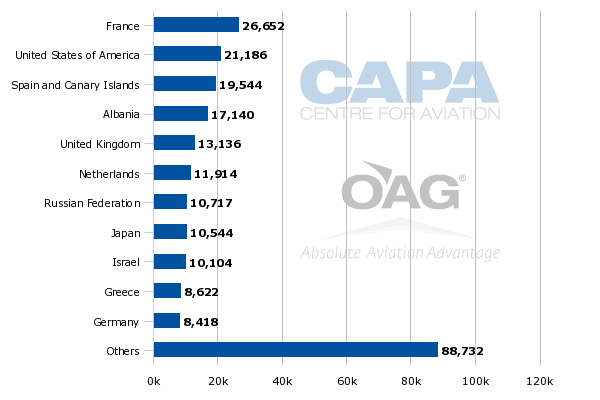 For Alitalia, Germany is only its 11th biggest destination country, representing only around 3% of its international seat capacity and less than 2% of its total seat capacity (source: OAG, the week of 13-Oct-2014). Alitalia has only three routes between Italy and Germany. Austria and Switzerland feature even less prominently in Alitalia's scheduled, which has only two routes in each of these countries (Rome and Milan to Vienna and Rome to Geneva and Zurich). The routes operated by Alitalia and the airberlin group from Germany, Austria and Switzerland to Italy are largely complementary to each other. Alitalia does not operate on any of the 30 routes flown by airberlin between Germany and Italy, nor on airberlin's seven Switzerland-Italy routes. Alitalia's three routes to Germany (Rome to Frankfurt and Munich and Milan to Frankfurt) are not operated by airberlin group airlines and nor are its two Switzerland routes. There are only two city pairs where there is overlap, both of which are operated by NIKI and Alitalia. These are Vienna to Rome Fiumicino and Vienna to Milan. 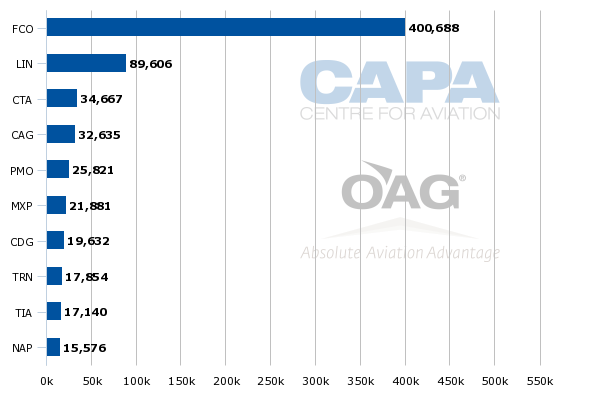 According to OAG data for the week of 13-Oct-2014, NIKI is the leading airline on Vienna-Rome Fiumicino, with 48% of seats. Alitalia has a share of 24%, Austrian Airlines has 17% and easyJet 10%. On Vienna-Milan, NIKI currently operates to Malpensa, but will switch this to Altalia's main Milan base at Linate. NIKI has a 31% share of Vienna-Milan seats and Alitalia has 10%. Austrian Airlines also operates the city pair, flying to Malpensa, with a seat share of 59%. Airberlin's 30 routes from Germany to Italy are split between Berlin Tegel (eight routes), Duesseldorf (eight), Munich (six), Stuttgart (five) and Cologne/Bonn, Frankfurt and Nuremberg (one route each). They are comparatively small, niche-like routes in terms of airberlin's seat capacity. Airberlin operates more than 2,000 weekly seats on only three routes to Italy (Berlin to Rome and Milan and Duesseldorf to Milan). This compares with seat capacity on the top ten international routes on its network, which range from 20,000 seats down to 9,000 seats per week. Nevertheless, airberlin has strong market positions on its Italy routes, ranking number one by seats on 23 of the 30 and number two on the remaining seven. Based on city pairs, airberlin's most frequent competitor is Germanwings, followed by Lufthansa, easyJet (which is the main competitor from Berlin) and Ryanair. Overall, airberlin is the number two ranked airline behind Lufthansa by number of seats between Germany and Italy. Airberlin's share of 15% compares with Lufthansa's 40%, which becomes 62% when Lufthansa subsidiaries Germanwings and Air Dolomiti are added. Ryanair is close behind with 12%. Seventh-ranked Alitalia's 2% market share will mean that the airberlin-Alitalia codeshare will encompass 17% and make little direct difference to airberlin's competitive position between Germany and Italy. Airberlin is the largest airline by seats on all seven of the routes it operates between Switzerland and Italy. Alitalia does not compete on any of these routes, six of which are from Zurich and all of which are summer leisure routes. airberlin is ranked a fairly distant third behind SWISS and easyJet on routes between Switzerland and Italy, with a market share of 10% by seats. Etihad Regional, which awaits regulatory approval to join the Etihad equity alliance, has 7% of this market and Alitalia has 6%. Airberlin and Etihad Regional already codeshare on Zurich to Catania and Olbia. If Etihad's investments in Etihad Regional and Alitalia are completed, then its equity partners will have a combined 23% share, still behind SWISS and easyJet, but representing a much more significant position. Airberlin's NIKI subsidiary has a 32% share of the Austria-Italy market by seats, behind Austrian Airlnes on 52%. Alitalia is raked third with 13%. The biggest part of this new agreement is Germany-Italy, where Alitalia's 2% share is very small. So how does each party benefit from the partnership? For Alitalia, the main benefit will be to open up to its passengers more destinations in Germany (and Austria and Switzerland) that carry its AZ code, facilitating transfers and providing its frequent flyers with additional opportunities to redeem their points. It should also enjoy some additional feed from airberlin into that part of its network that will carry the AB code. For airberlin, the main advantage from the agreement should be additional feed into its network. Although Alitalia's capacity to Germany is small, its presence at many of the Italian airports that airberlin serves (Fiumicino, Linate, Catania, Cagliari, Malpensa and Naples are all in Alitalia's top ten) will provide many opportunities for passengers from elsewhere to connect to airberlin's network under the AZ code. Airberlin will also be able to offer its passengers a wider network in Italy and beyond. Feed from codeshare partners has become an important theme for airberlin over the past couple of years. The airline's passenger load factor grew from 77% in 2010 to close to 85% in 2013, partly assisted by partner feed and also by cuts in capacity. It has returned to capacity growth in 2014 and this increases the need to generate additional traffic through its network. However, its passenger load factor has slipped by 1.5ppts in 9M2014, suggesting (among other factors) that the impact of partner feed may be weakening. Common codeshare bookings with oneworld partner airlines more than tripled in 2013, although this growth slowed to 12% in 1Q2014 and just 2% year on year in 2Q2014. Airberlin expects that the new codeshare agreement with US Airways, commenced in Jun-2014, will give a further boost to its oneworld common booking numbers. Common codeshare bookings with Etihad Airways grew by 74% in 2013, but this also slowed to 12% in 1Q2014 and just 2% year on year in 2Q2014. Airberlin and Etihad aim to generate additional revenue from their codeshare of EUR200 million between them in 2014. Airberlin had expected its winter 2014/15 schedule to stimulate growth rate with its new Abu Dhabi services from Stuttgart and Vienna and the increased frequency of its Berlin Tegel-Abu Dhabi service (moving it to double daily from once daily). … but rejection of Etihad codeshares would threaten its incremental revenue targets. However, the decision by the German authority to deny permission for Etihad's code to be carried on around half of the routes previously operated by airberlin under the codeshare agreement raises questions over the achievement of its incremental revenue targets. For an airline that has struggled with profitability for several years, this is a worry. Responding to the LBA decision, airberlin CEO Wolfgang Prock-Schauer said "the airline will take all legal steps within its power to fight this decision." A spokesman for the transport ministry said the 34 codeshare requests were rejected based on the air services agreement between the Germany and the United Arab Emirates (Reuters, 10-Oct-2014). It is certainly curious that the LBA chose to reject the codeshare this winter on routes that have been approved in the past. It is, perhaps, another sign of the strength of the anti-Etihad lobby in Germany and Europe more widely. A European investigation into a number of investments by non-EU airlines in European carriers, including Etihad's 29% stake in airberlin, is ongoing. In the airberlin case it is a comfortable side effect for main opponent Lufthansa that the LBA decision would weaken its main - and much smaller - competitor in the German market. See related report: Airline ownership & control. Why might Europe uphold something its officials call "stupid"? A number of media outlets have reported that the LBA reversed its decision on the rejection of the airberlin/Etihad Airways codeshare routes for the winter 2014/2015 season, ahead of a meeting between Germany and the UAE on 20-Oct-2014 to discuss their air services agreement (The Wall Street Journal/Reuters/Gulf News, 16-Oct-2014). Airberlin has suggested that the decision was "misunderstanding on the interpretation of the codes-share provisions” in the Germany-UAE bilateral agreement. It will be hoping that the LBA will stick to its revised position in the longer term, rather than taking a more protectionist stance. The new codeshare with Alitalia is a welcome step for airberlin, but it may not be enough to offset the reduction in Etihad codeshare routes if the LBA again once again rejects them.